June: June on course to be wettest in a century: Flooding, storms and persistent showers have blighted the country in recent weeks putting this June in line to become one of the soggiest in 100 years. 25 June: Spring is wettest in Britain for 250 years - England and Wales are on course for the wettest late spring and early summer for 250 years, experts said yesterday. June has just seen its fourth washout weekend and yet more downpours are forecast. 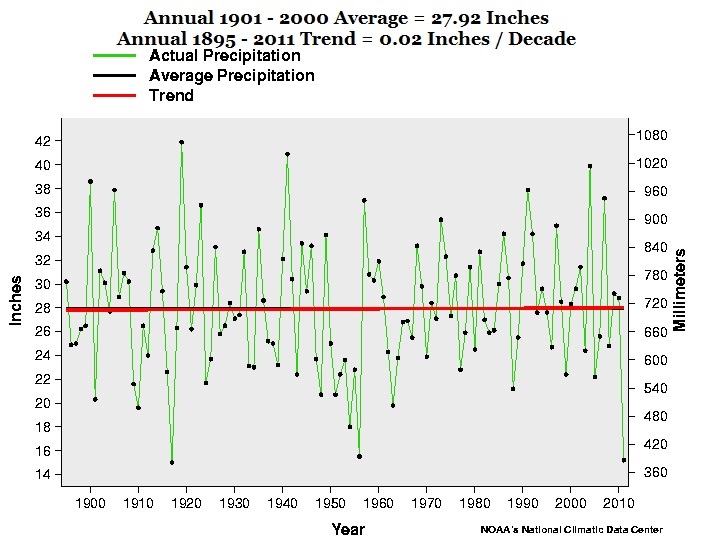 Now it is feared combined rainfall for April, May and June will break the record of 13.2in (336mm) set in 1782 and be the highest since records began in 1766. Note: the sun 3 years and 7 months after the solar minimum. By using other spectral bands and zooming in very close, the observatories are able to see a few pores or specks that never would have been seen with old technology. 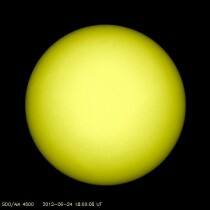 Sunspot number yesterday was between 10 and 13 unadjusted. 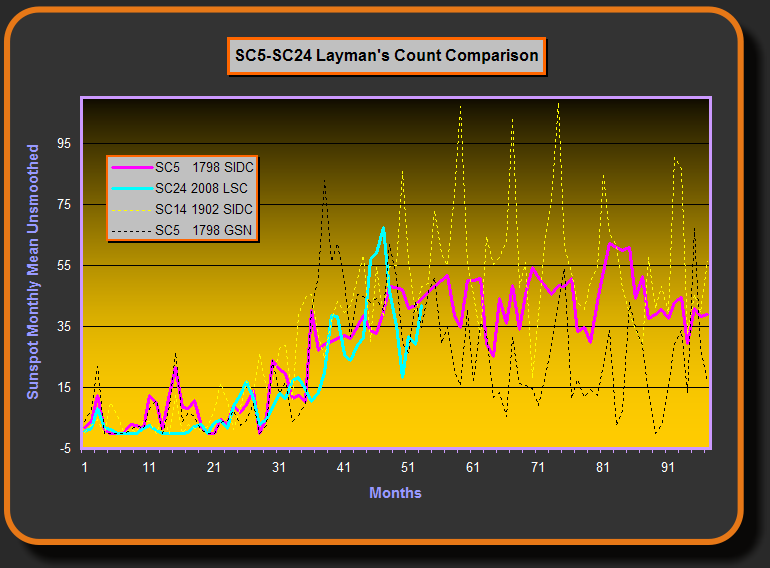 Three days without a sunspot on Layman’s Sunspot site which tracks only spots large enough to have been seen before. 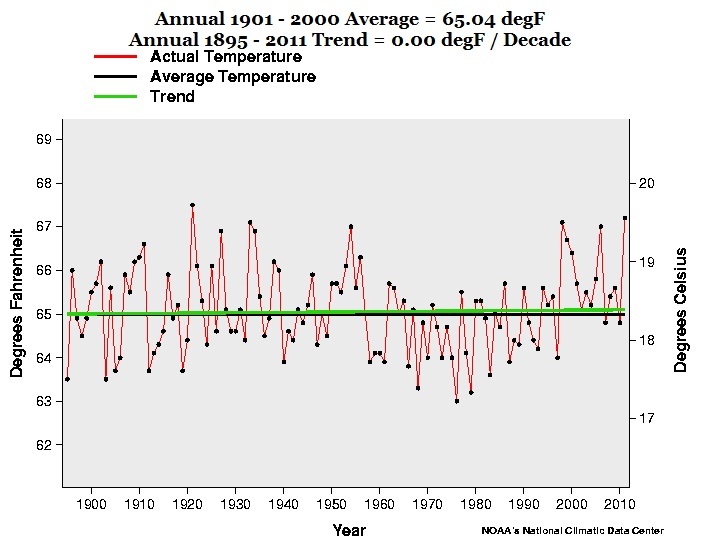 We are tracking very close to cycle 5 in the Dalton Minimum. There is a lag of maybe 8 years between solar activity levels and global temperature affects. 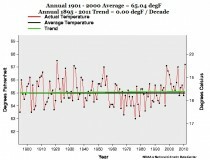 The sun went very quiet after 2006, which would suggest temperatures will dive in a year or two. 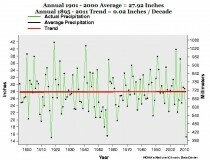 The leveling off since 1997 has been due to the change in the PDO to cool. When the sun cooling sets in and the Atlantic cooling begins (5-10 years), the world will be focused on cold and how we can get more fossil fuels to provide heat because the wind farms and solar farms are not meeting the needs. Recall that despite a huge investment in wind in the UK, in the frigid weather of December 2010, the wind provided just 0.6% of the electricity need for the UK and millions were placed needlessly in energy poverty, having to make a decision whether to heat or eat. That is our future if Obama and his green pals continue their rule and the EPA is not controlled. 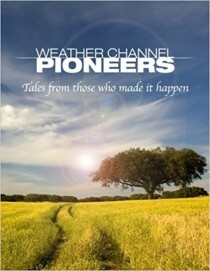 See Joe Bastardi challenge Jeff Masters of Weather Underground (name says it all) on the role of the sun and oceans on Real Science. 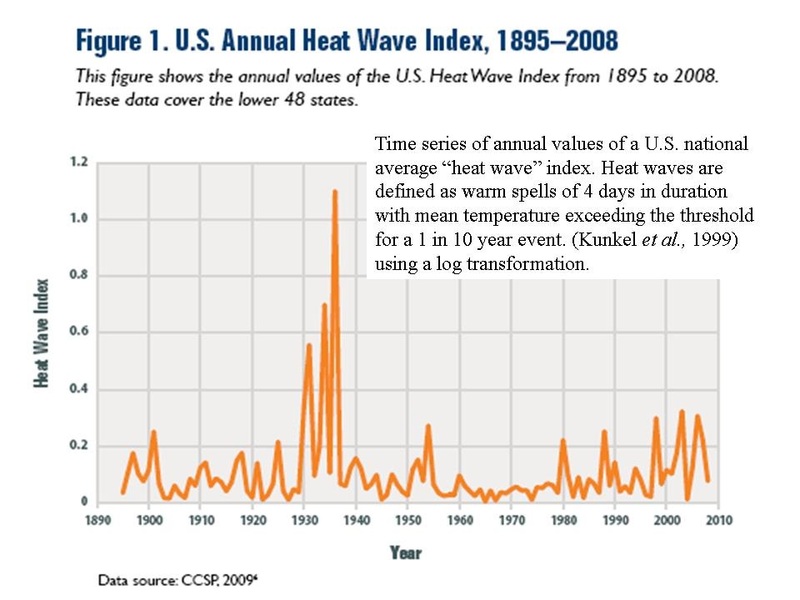 Today the once great magazine Scientific American continued to propagate the hoax of global warming by blaming the two day heat wave in the east on greenhouse gases. They held an on line briefing by David Biello, chief propagandist today. First of all extreme cold kills twice as many as extreme heat. This will increase in the future if the greens have their way as power brownouts and blackouts and soaring heating oil prices and electricity rates put more and more people into fuel poverty. This will also cause more deaths from the heat waves that are an inevitable part of summer. 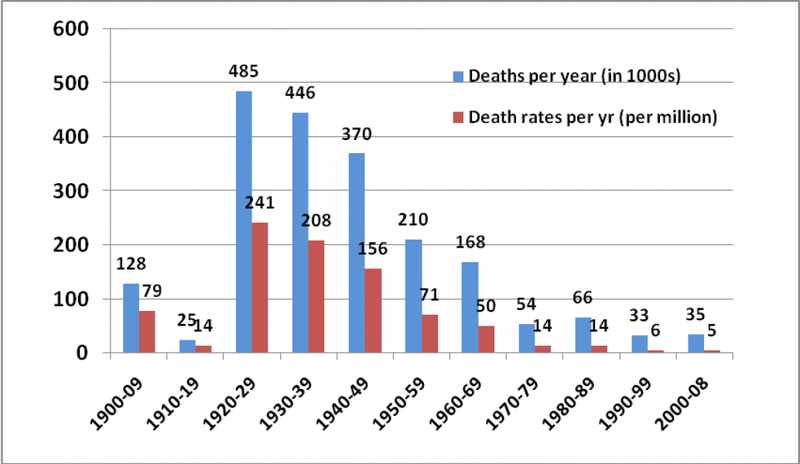 Here is a look at Global Death and Death Rates Due to Extreme Weather Events, 1900-2008. Source: Goklany (2009), based on EM-DAT (2009), McEvedy and Jones (1978), and WRI (2009). Global rates have declined, which is disappointing to the radical population control freaks among the greens. This month in the northeast had been cool without 90 degree days the first 19 days. Boston was averaging 4.7F below normal and Central Park 2.5F below. Cooler than normal weather followed the three day summer heat. 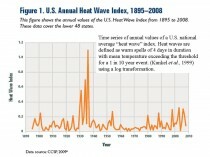 Here is the EPA’s own heat wave Index. 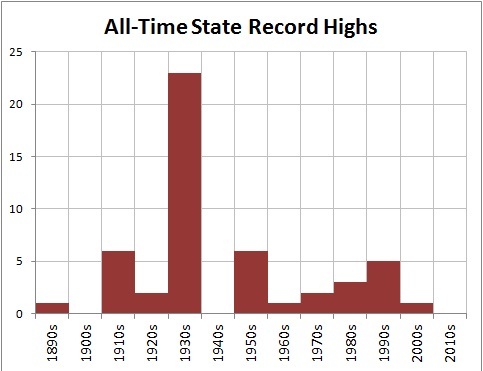 Here is a plot of state all-time record highs by decade. 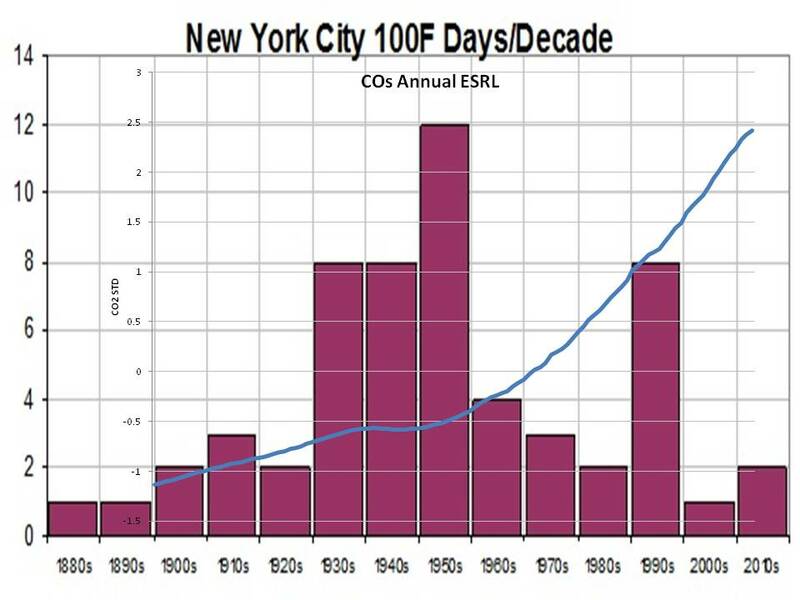 Temperatures did not reach 100F in NYC or BOS. 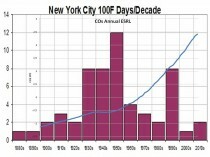 100F are not new phenomena. Also there is NO correlation with CO2. 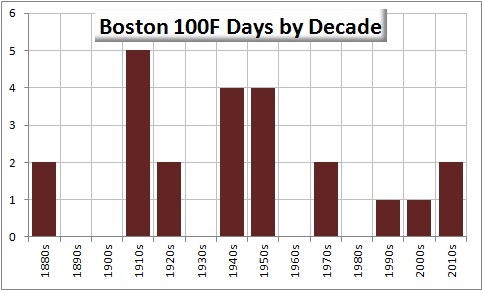 Boston also shows no upward trend. 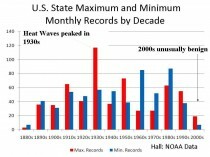 Here is all 50 states all 12 months the records by decade through the 2000s. Latest occuring record year used. The 2000s was an unusually benign decade. 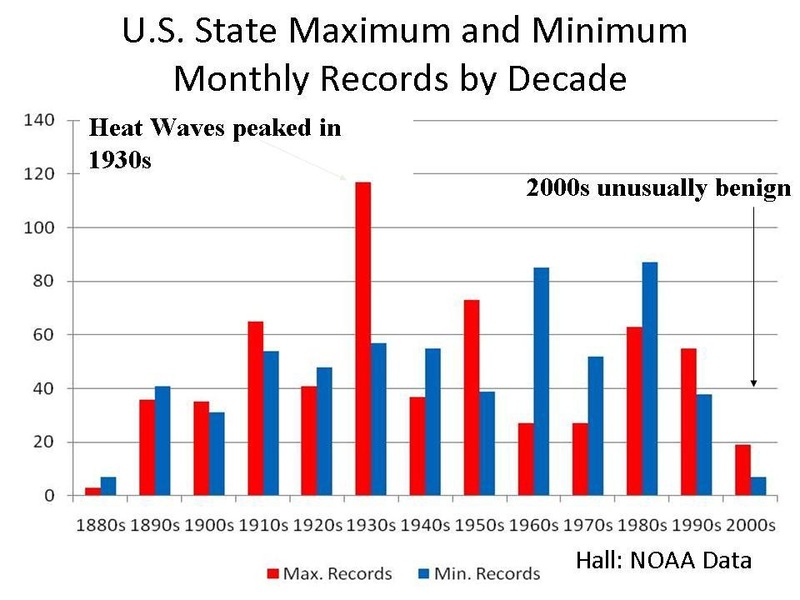 Last year had some brutal heat in Texas and Oklahoma and yes, this past winter and spring on the rebound from the second strongest La Nina in history and two of the coldest winters it was warm in the lower 48 states (though brutally cold in Eurasia and Alaska. Even with the heat and drought, the last 117 years shows no trend for Texas in Temperatures and a very slight upward trend for precipitation. Let’s see the tune Biello plays in winter when the snow and cold invade North America and the lower 48 states as a weak El Nino comes on. I am glad I cancelled my subscription to Scientific American and Science and Nature. You may wish to consider the same.